Hi, I'm curious as to the capacities you are thinking of integrating in Publisher and Photo. - Hi-end justification and kerning, and overall pro-level typography.. so far apart from iCalamus, all the "smaller" DTP apps I've seen on Mac are very unprofessional and make them unusable in "real world" design situations. - Ability to import InDesign (or XPress.. not my worry anymore.. but) files. As to me this would be the deal maqker or breaker, I have so many files I repurpose, it would be hard making a switch if that weren't case. It's also how able to make the switch from XPress to InDesgin yar ago, I could import my old XPress files (not alaways perfectly but sufficiently to feel I could switch. I'd love to leave the Adobe "sphere" but InDesign is really what keeps me there. - Ability to place layerd files from your Photo app.. and only turn on a selected layer (as one can do woth Photoshop files in InDesign). - Advanced Pre-press preflighting, batch pdf export, of single pages for large fiels (magazines and such). - Anything like Smart Objects in the works.. allowing to embed Designer vector files and edit them back in Designer. Depends on what you class as pro-level. If you mean multiline compositor then no we will not have that in our initial release. If you mean optimum word spacing, hanging indents, strong OpenType support then yes. If you give actual details then I could give more info. Sorry but not for the initial release. Yes and you can even edit the actual layers if you want. It's the same file format so all app edit all files. These features will build up over time but are beyond the initial scope of the project. Yes but much better as discussed above. Probably not what you wanted the hear but I would rather be honest. If AD over steps into APh territory in its secondary persona: then where will APu overlap into vector territory or page layout territory? Affinity Photo will have some vector tools and the same text tools as Designer but the only export from Photo will be pixel formats. I assume that Publish will, like Designer, be able to open PDF files and turn them into editable documents. If that is the case, it is already a winner in my book. To do that, in inDesign, an expensive extension must be bought. Yes, Publisher will open PDF files and also place them. We aim to make Affiniry PDF support the best out there. It will take us some time but we will get there. Hi! it exists beta programs of publisher and photo? I just bought AD and am loving it!!!! Great job guys. I am really excited for your next two programs. I am a graphic designer that is getting into photography and love designing layouts. I could not imagine a more perfect setup of software that I would use on a daily basis. How do we sign up for the beta? is there a special invitation that wee need to receive, or can anyone sign up? You can access the beta from the Affinity Designer Beta section in the forum. The latest beta version is here. Hello? Any news on Affinity Publisher? Affinity Publisher should be in beta by the end of this year with a launch likely in first half of 2016 if everything goes as expected. Liking where Designer and Photo are going. Tested out Designer simultaneously with Adobe Illustrator. Designer faired well. Sure not as many features yet and the import export to and from AI had a few issues but I would love to see someone make a viable alternative to the overpriced (but very good) Adobe Suite. I haven't found a DTP that comes close to Quark or Adobe ID yet so I am anxiously waiting for Affinity Publisher to come out. PS I hope you include Spreads and with separate inside and outside page margins and export to ePub. Is XML DTD support (specifically DITA) on the roadmap for Publisher? XML support in InDesign is feeble to say the least. Will it be able to export in IDML format? That would be great! Hi, I've just heard days ago that there will be a layout and typesetting addition to the Affinity line of apps, which, if it turns out well, would allow me to ditch all of my Adobe apps, which would be very liberating. Please allow me to chime in on the feature discussion, in particular, opening InDesign files. Have you (the developers) looked at the InDesign Exchange format (INX)? 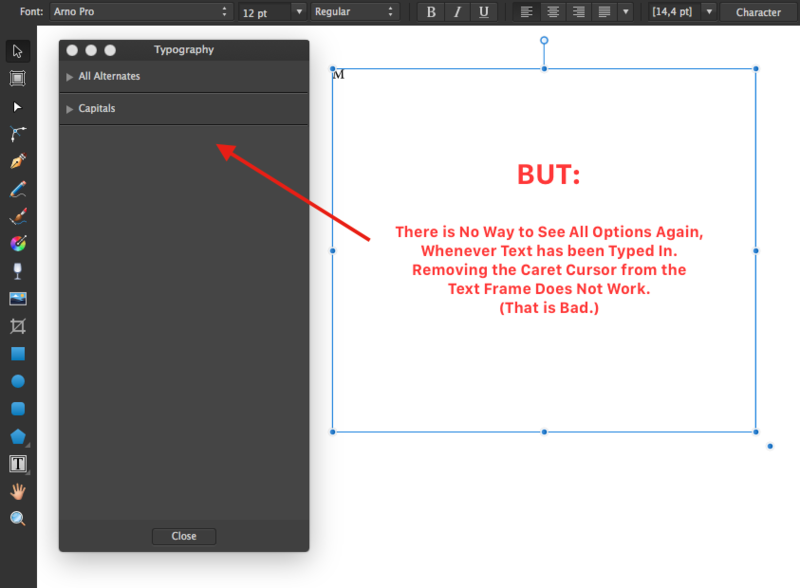 It's one of the save/export options in every InDesign version I've known. It's a bundled file containing a number of XML-based files that describe the complete document losslessly. The structure is superficially very much like the Open Document Spec (for office apps). This should be *relatively* easy to read/import as it's pretty verbatim and self-explanatory and does not require any reverse-engineering or "guesswork". It was created so that users of different versions of InDesign can exchange their documents, which works perfectly. The INX files are even *smaller* than InDesign's native format, so I wonder why that's not the default format. My guess is that InDesign's native format is simply a dump of the internal object structure in memory (which can be re-converted to the live memory structure very quickly), containing all sorts of intermediate/cache data, which is why it's so large, and why it would probably be lots of work to reverse engineer. So, on the side of the developers, this (an INX file reader/parser) would probably be economically feasible to implement, and on the side of the users willing to switch, all you need to do is export all your InDesign files to INX and you're done. You could even write an AppleScript to do that automatically for a large number of files, I'm sure. Has there been any updates on this? Yes, for bad news click here. If you give actual details then I could give more info. Input of the cap heights (from launch)? Alert of orphans? More units than in AD? Way better than InDesign's implementation. We're pretty happy with our current UI for OpenType. 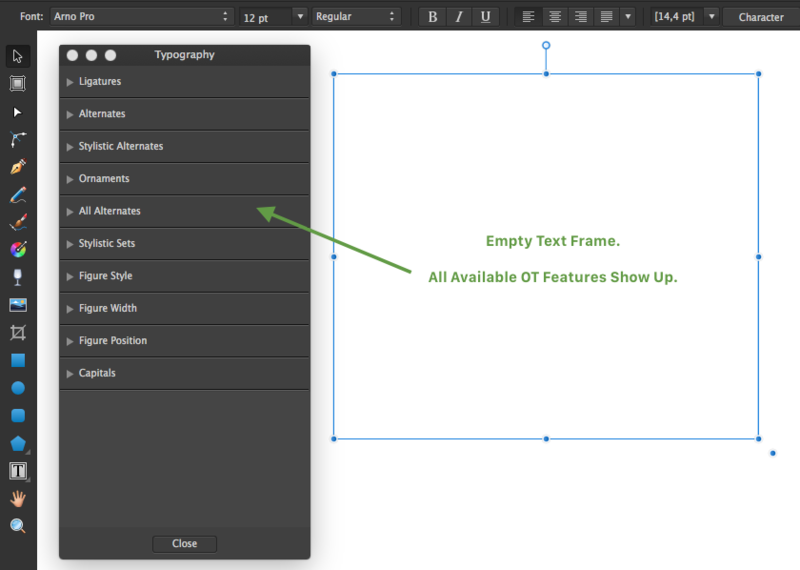 The Typography panel shows what features are available for the selected font, and previews them with the selected text. I am sorry, but I am not happy with the current implementation in some of its aspects, and I would like to strongly suggest improvements of the Typography panel. Let me just address one point. It seems that we loose the option to see all available Open Type features in a font, as soon as we insert text into a text frame. And that is a huge issue. Create an empty text frame. Unless you insert text, you will see all Open Type Features present in the font. Insert some text. 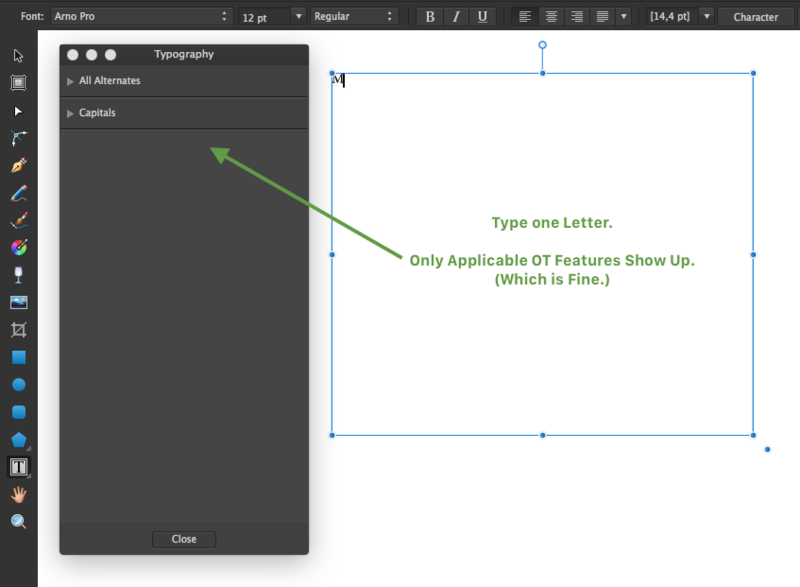 Only Open Type features applicable to the inserted text are shown on the Typography panel. But there is no way to ever see all available Open Type Features in the font again, unless the text frame contains text where this features are applicable. What are the OpenType features in this font? How do I apply the OpenType features?  Where have the OpenType features been applied? But professional users are not happy because they need additional software to use all features of a font.